STUDY PLANS PACKAGE R434 ALL VERSIONS. Radius Chine Steel, MC Steel, Fiberglass, Aluminum or Wood Epoxy. This design has appealed to many serious cruising sailors, and is another in our range of medium displacement, fast performance cruisers which can be built in either multi chine or radius chine STEEL or ALUMINUM, in round bilge FIBREGLASS or in round bilge WOOD EPOXY. Full size frame patterns as well as cut to size steel kits are also available for this design. 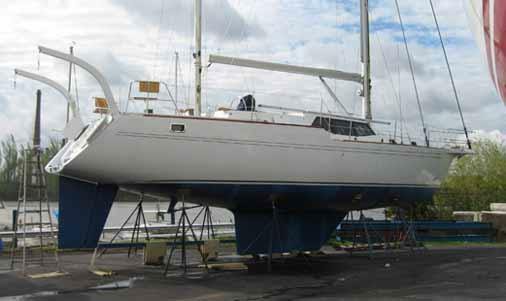 The Roberts 434 can be rigged as either a Cutter, Sloop or Ketch and the many different versions give you the choice of either a low profile aft cockpit, a center cockpit version and also a pilot house version. Already several versions of this design have made complete circumnavigation's - one was sailed single handed around the world in only 218 days. 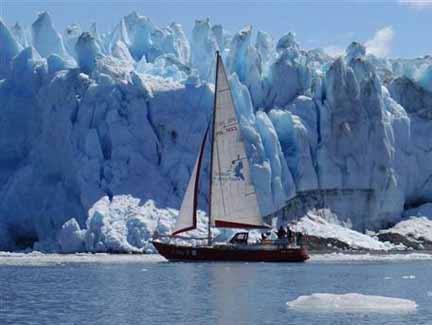 (Article printed below) Several others have taken part in round the world rallies. Many are being constructed in yards around the world with the pilot house version currently being one of our most popular designs. 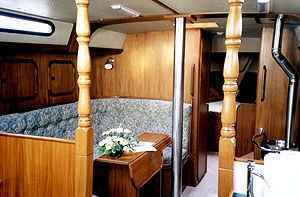 You can purchase Study boat plans, Complete boat plans and Patterns, Pre-cut steel kits, Hull and Deck packages or complete boats built to this design. Please email for additional information. L.O.D. 13.20 m 43' 4"
L.W.L. 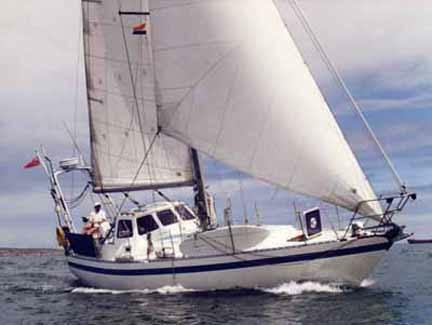 11.18 m 36' 8"
DRAFT (Deep) 1.83 m 6' 0"
(Shoal) 1.50 m 5' 0"
The Roberts 434 boat plans come with a variety of sail boat plans including sloop (shown) cutter and ketch. Other rigs are possible to suit your personal preference. Hi Bruce, I studied calculus & Differential equations but it still amazes me as to how accurate your drawings are. Everything is coming out to within a 1/16th of an inch. 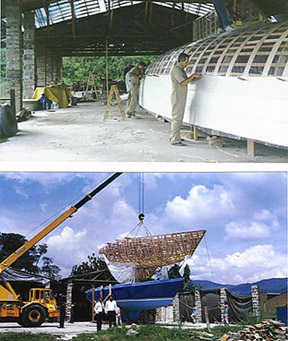 I received the boat plans on Labor day and presently I have the stem completed, the keelson completed and will begin to install the first layer of stringers. I will go and develop the photos that I have and send them to you. I built an 8' x 8' work bench to build the mould frames on and then tore that one down and built a 2'-8" x 16'-0" work bench to work on for the remaining parts. I believe this saves me many hours of labor verses crawling around on the floor ( I too old anyway for that). I also took 1/8" hardboard and made master full size patterns of the mould frames first. 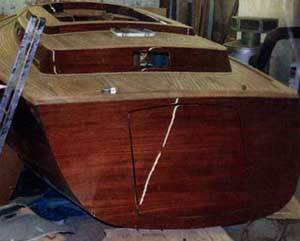 This was to improve accuracy and for future ease of cutting the bulkheads. 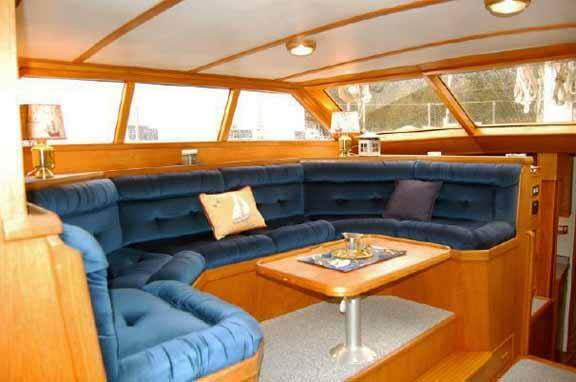 I find myself already wishing I was building a 65 footer so this very likely will not be the last design you sell to me. Don't forget to send me some names of others working on similar projects; I want to pick their brains for places to purchase materials at really good prices. All these photos are included in the STUDY PLAN PACKAGE. A FEW MONTHS LATER !!! 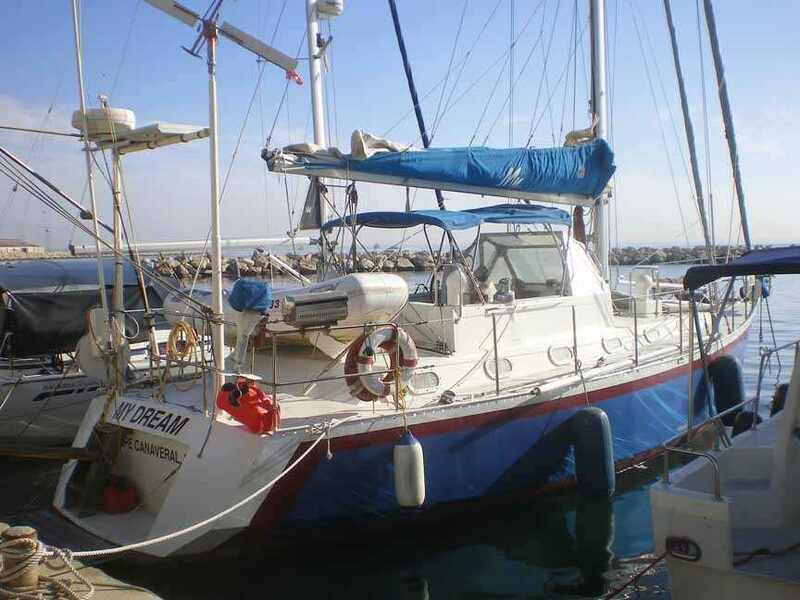 HI Bruce, I just thought I should mention that every marina we enter, our boat is the star attraction. Many people have asked me what name brand boat I have because they would like to purchase one. We have got so many compliments that I cannot number them. Just last weekend a fellow said now that is one cool sailboat and another heard him say it and he replied you got that right. All the people in the marina usually come over to view our boat. So you get a feather in your hat Bruce! 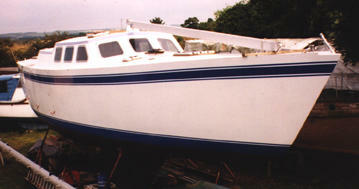 I only lowered the pilothouse roof to make it more racy and sleek looking and changed the stern to a sugar scoop. The design remains entirely yours, Bruce and I tell everyone what a great designer you are. 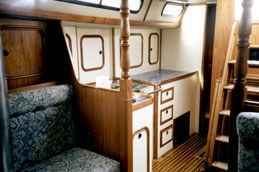 We have only been out in 8’ seas and the boat handles very smoothly and takes the seas with ease. It was nice to hear from you again. We recently got our 6 cu ft chest freezer to come one line and it works perfectly. We have a separate 4.5 cu ft refrigerator. We were handing out ice cream bars to the other gunkholers. SINGLE HANDED AROUND THE WORLD. 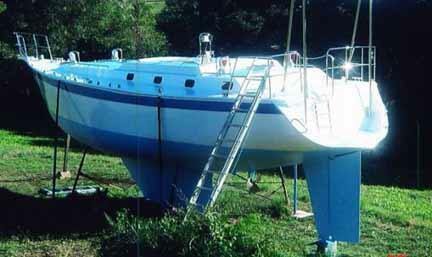 Dear Mr Roberts, A quick note to let you know that I have finished my circumnavigation in the Roberts 434. 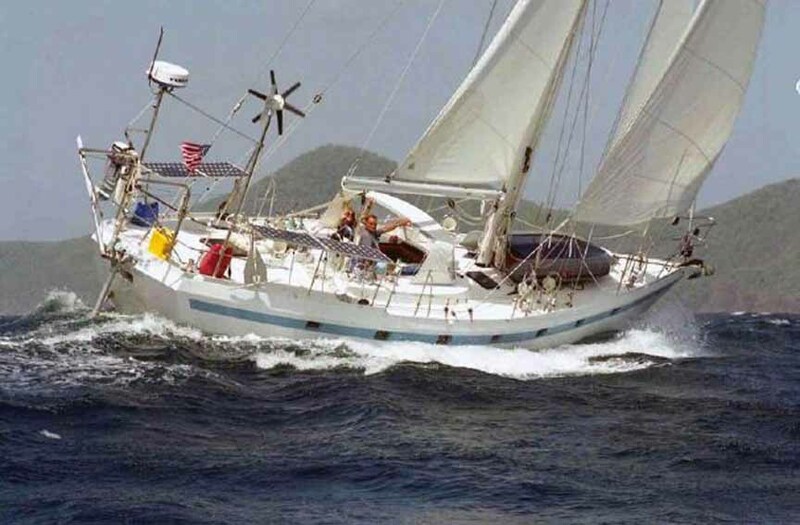 She took 218 days and 8 hours sailing time to cover the 27,000 miles, In terms of elapsed time this is the fastest E-W ever by any kind of sailing vessel, but of course we do not get the world record as Guinness work on average speed and she was half a knot slower than the "Ocean Bound" (David Scott Cowper) nevertheless not bad for a backyard building job. 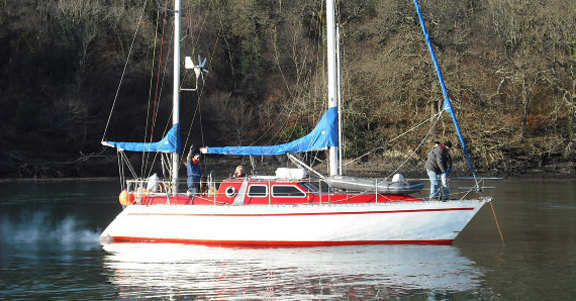 She is in excellent condition and could go around again given a bit of sail repair. She is very fast for a heavy boat (3 tons of stores). 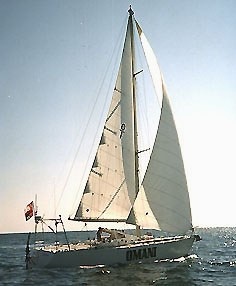 She often reached 10 knots and could sustain 9 knots for hours on end. Her best day's run was 210 miles without current assistance. Her directional stability is excellent and in good conditions to windward she can hold her heading unaided for up to 20 minutes. I had one knockdown to 90 degrees and a few bad broaches but she picked herself up without difficulty. She is a superb boat, indeed she has to be to bring an incompetent single handler like me home safely. Best wishes to you and many thanks for a fine design. I am starting to think about something in the 60-65' range. Yours, Signed, Pat Garnett. has a great motion. It is cutter-rigged and we sailed it into Greys Harbor, across the bar, in about 10-20 kts of wind, it did fine.....I LOVE IT!!! Wood Epoxy under construction ... 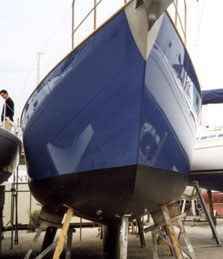 This boat has now been completed and and is used in the charter business in Europe .. the owners are delighted with the boat which is fitted with special shoal keel that we designed for this particular boat. 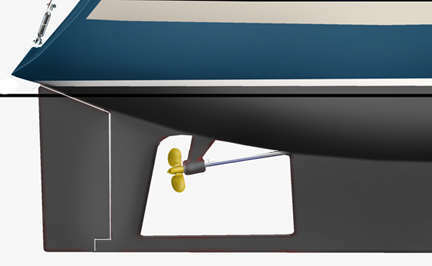 This illustration shows the male hull mold covered with either thin pre-laminated fiberglass strips or inexpensive plywood or hard-board followed by the inner fiberglass laminate, next either foam or balsa core and finally the outer layers of fiberglass. 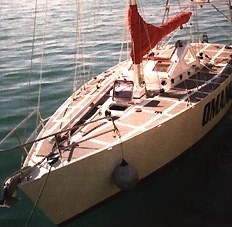 Note the area of the keel is not cored but has additional fiberglass laminate to provide maximum strength in this area. Roberts 434 small portion of a very large interior. steel hull built in the U.K. RAPID RESPONSE: CHEERS BRUCE, I Received your study boat plans some time ago, But I haven't had time to Thank you for your rapid response. So thanks Bruce, the boat plans are a good carrot for me to chew on while I start to save for Boat Building . My choice of boat would be the Steel hulled 434,There's a couple of my Diving Buddy's at work on their 434's as I write this E-mail Today. 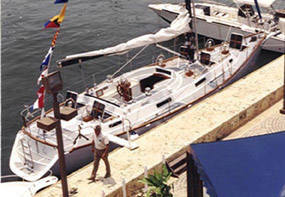 Both boats look pretty impressive, I can't wait to start on my baby. Thanks S.J.Robinson. 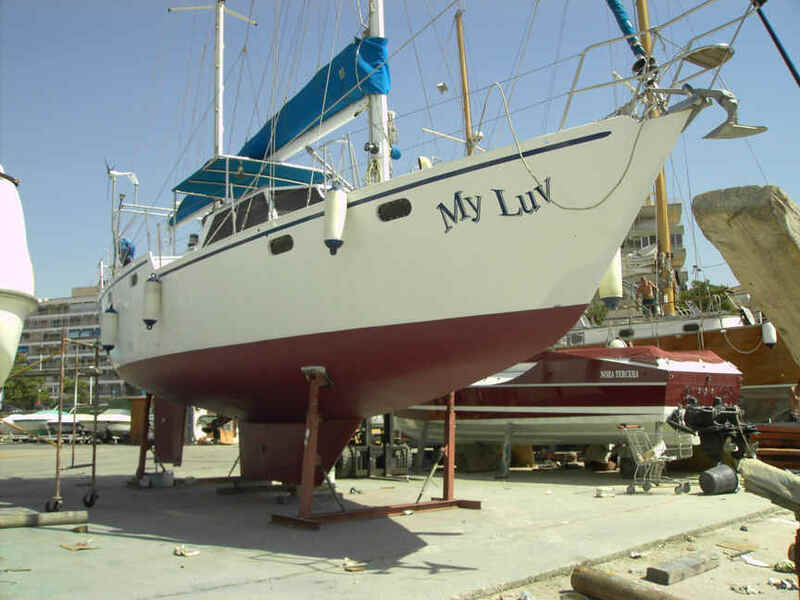 ANOTHER ROBERTS 434: Dear Sir, A customer of yours named Lou Hunter built a 434 in Alameda, CA and they left for Mexico and points south in Nov. 1998.You'll be glad to know that Lou did a beautiful job, the boat was comparable to what very top quality professional yard would do. I haven't heard from him since he left, but he was an experienced cruiser and no doubt he and his wife, a very nice lady (whose patience I have great admiration for), are enjoying themselves greatly. He said the boat was very fast but was very comfortable and felt very secure. The name of the boat is "Tin Can", if you hear anything about a boat by that name you can bet it's Lou's 434 because I don't there's anyone else in the world who'd give their boat a name like that!!! Some day I'm follow Lou's example, although I may opt for a larger boat. Regards, Paul Braga Note from Bruce.....If you see this boat or any other Roberts 434.....let us know....we would like to hear from you.